This week, we’re looking at sleek and gorgeous stainless steel. Pros: Sleek, nonporous, easy to clean, and sustainable. It’s 100% recyclable and is typically made with some recycled content. 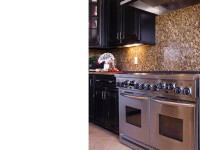 A stainless sink and backsplash can be seamlessly integrated into the counters. Cons: Scratches easily and shows fingerprints. Can be loud when struck with pans. How To Clean It: Wipe up spills with a damp paper towel. Clean with soap and water. Buff with a dry cloth to restore the shine. Want it? Give Stone Surface Specialists a call today on 801 856 0164 to schedule your FREE stainless steel consultation and sealing. Our experts can advise on any area of this gorgeous surface you’re unsure about.